There's an update out for the MindNode for iOS today and it's a doozy. 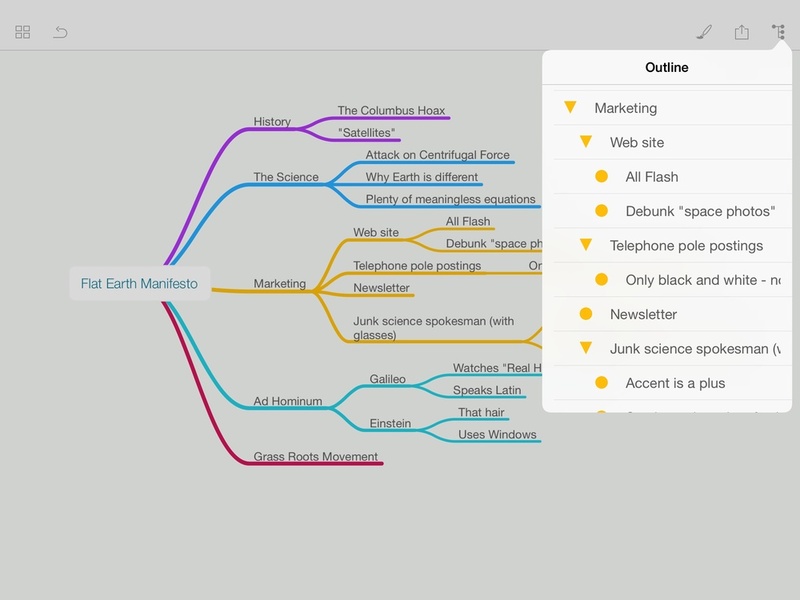 I first started buying this mind mapping application when it was just on the Mac. Actually, that was before there was an iPad. The thing that always attracted me to MindNode was the simple interface and, frankly, low-cost. For the longest time mind-mapping applications were one of those rare breeds where everything cost at least $200 and looked like it was created by Enterprise-class UI designers. In other words, ugly as sin. 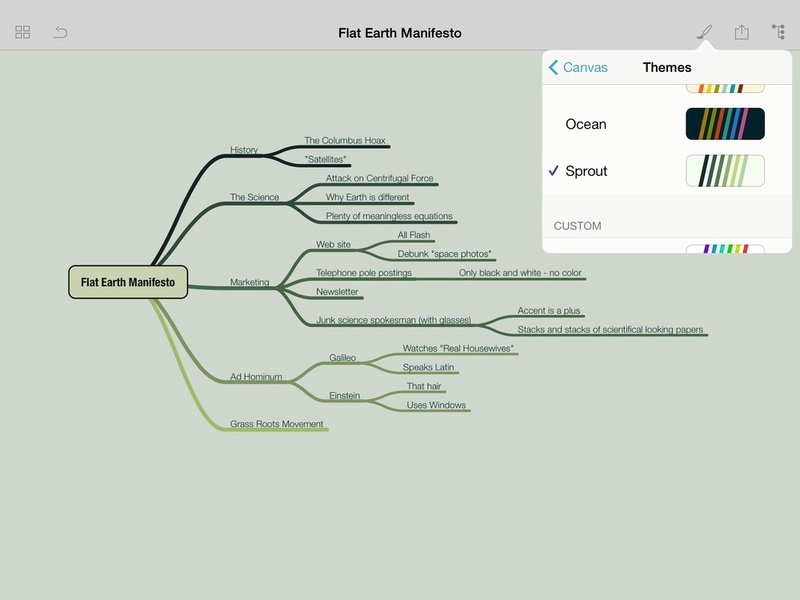 MindNode came to the game with a nice, simple mind mapping application with an attractive interface and a price tag of around twenty dollars. It didn't have every feature under the sun but I didn't need every feature under the sun. I needed a place to quickly create simple mind maps for my simple mind. MindNode eventually made it to iOS and for several years I've kept it in a folder. 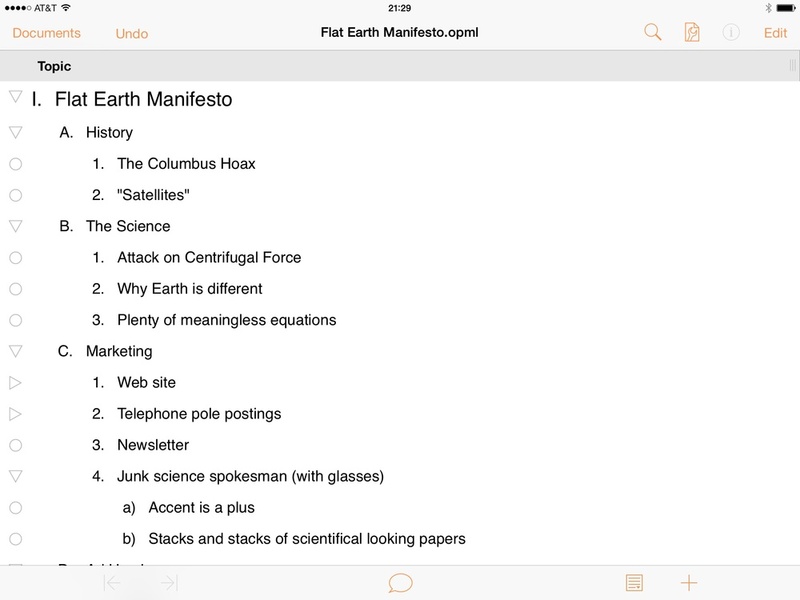 Even though MindNode has always been my first choice on the Mac, it has also always played second fiddle on my iPad to iThoughts HD. That is no longer the case. 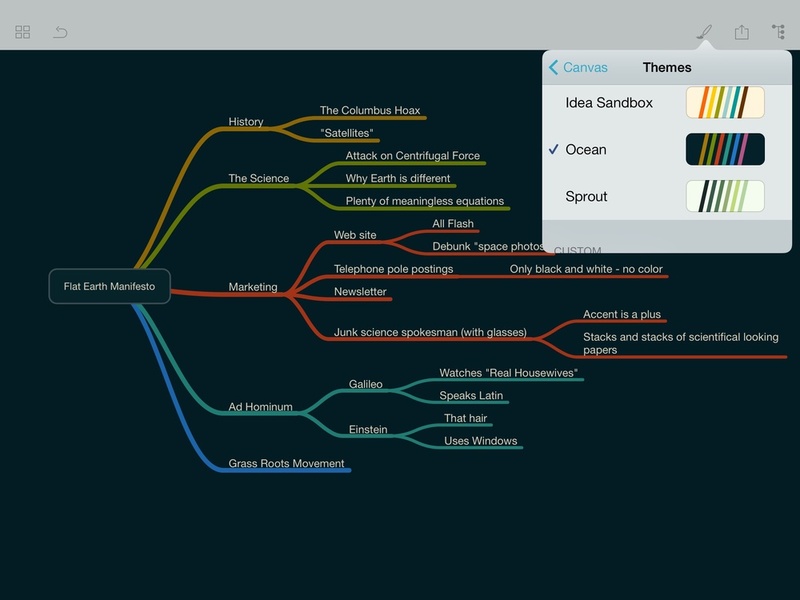 This update puts MindNode on an equal footing with iThoughts HD for me, which is saying something. MindNode's developer has been aggressively updating the application culminating in today's update. The user interface got an iOS 7 overhaul and it looks great. The built-in themes have great typography and color choices and you can quickly switch between them. The below gallery shows a few. There's also a custom theme if you want to set your own colors, typography and other settings. I've been using, primarily, the "Delight" theme as I've used this application through the beta period and it serves nicely. Another feature that has grown on me is the outline mode. There is an outline button in the top-right corner of the application. 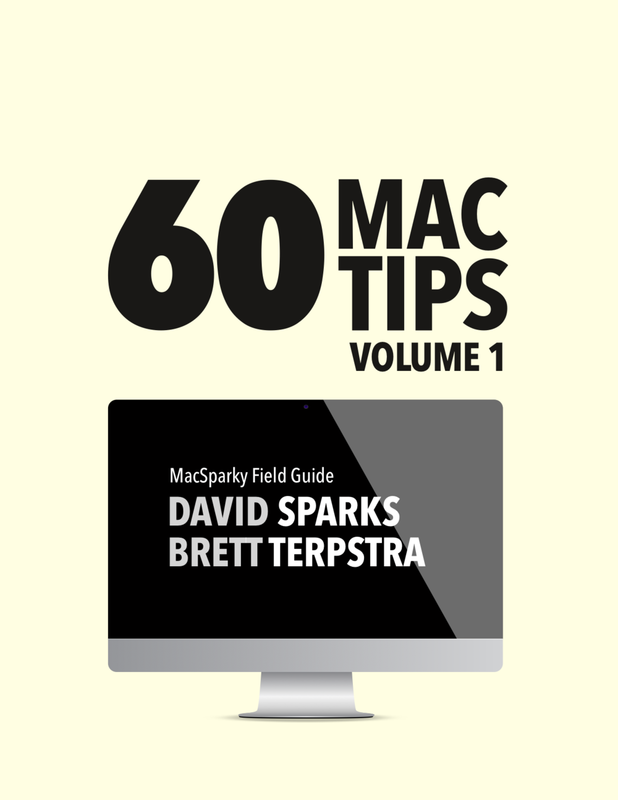 Tapping on it builds an outline from the mind map. The outline has hierarchical disclosure triangles that you can use to expose or hide various portions of the outline and tapping on an entry in the outline takes you to that entry on the mind map. This is quite useful for the way I "do" mind mapping. 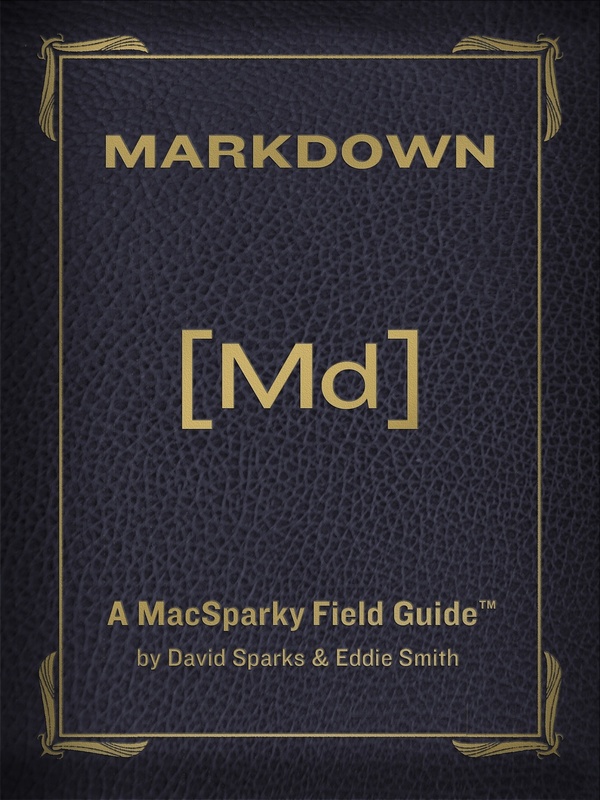 The application also now supports keyboard shortcuts. Three spaces gets a child node and three carriage returns gets a sibling node. These are the same shortcuts found in iThoughts HD and they greatly speed up mind map creation. 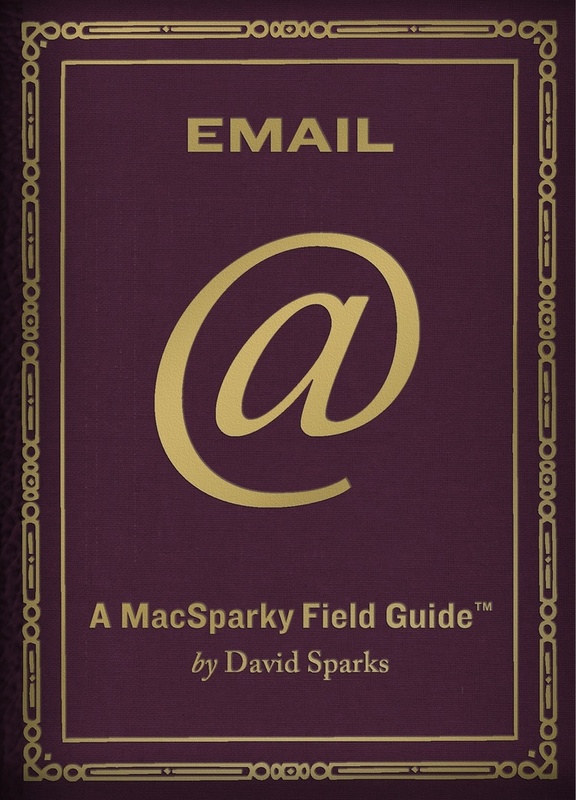 There are multiple export options including email, Dropbox, camera roll, and your printer. You can also send your MindNode mind map to other applications. 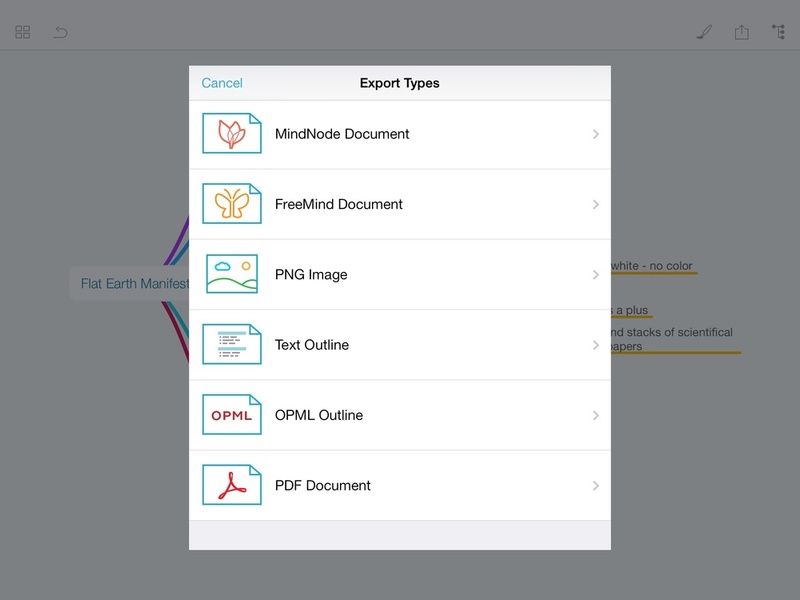 When you export a mind map, MindNode gives you several formatting options including the MindNode document format, FreeMind, PNG, text outline, OPML, and PDF. 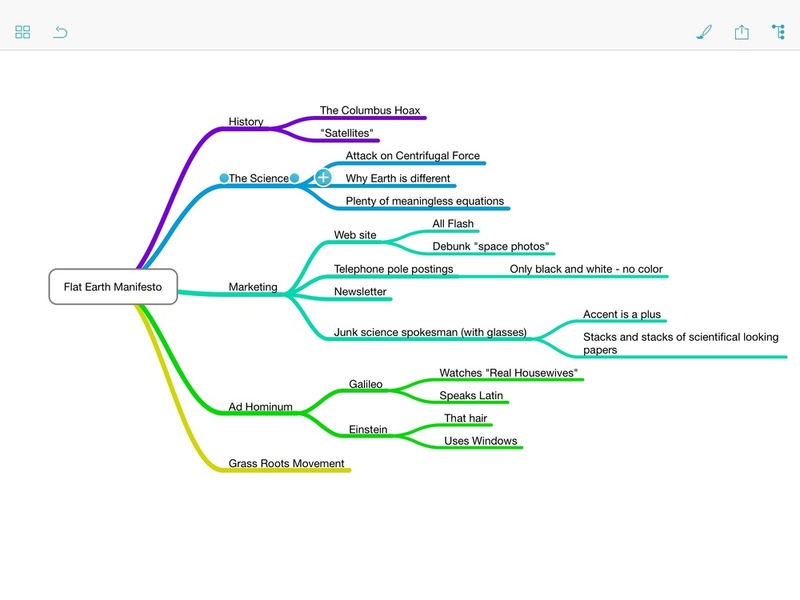 For example, the below screenshot shows my MindNode mind map in Omni Outliner 2 for iPad. I sent it directly using OPML export. While there are plenty of legitimate knocks against iCloud, file sharing with iCloud in an application like MindNode just works. 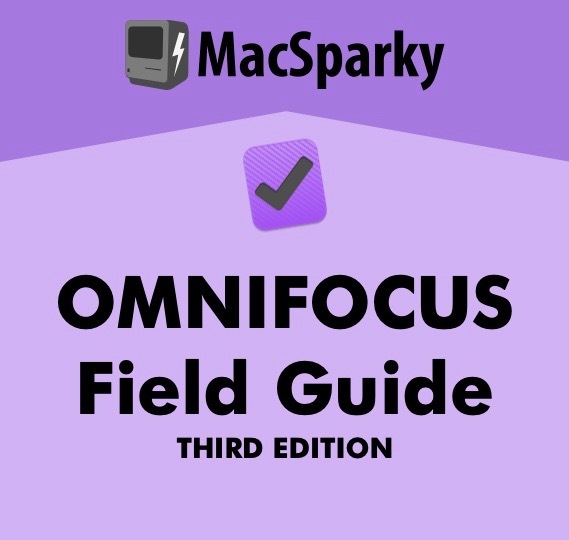 I own copies of MindNode for the Mac, iPad, iPhone and my mind maps sync flawlessly across the various devices. When I work on mind maps, I am literally cooking ideas and the soup always tastes better if I spend small bits of time over a long period of time instead of trying to knock it all out in one long session. 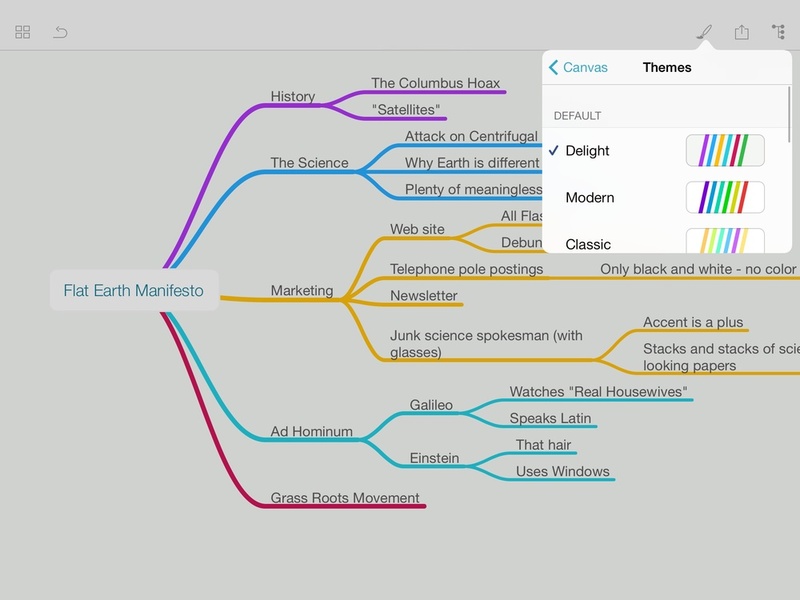 I need the ability to fiddle with mind maps from anywhere. As a result, having mobile access and painless syncing is a big deal for me. 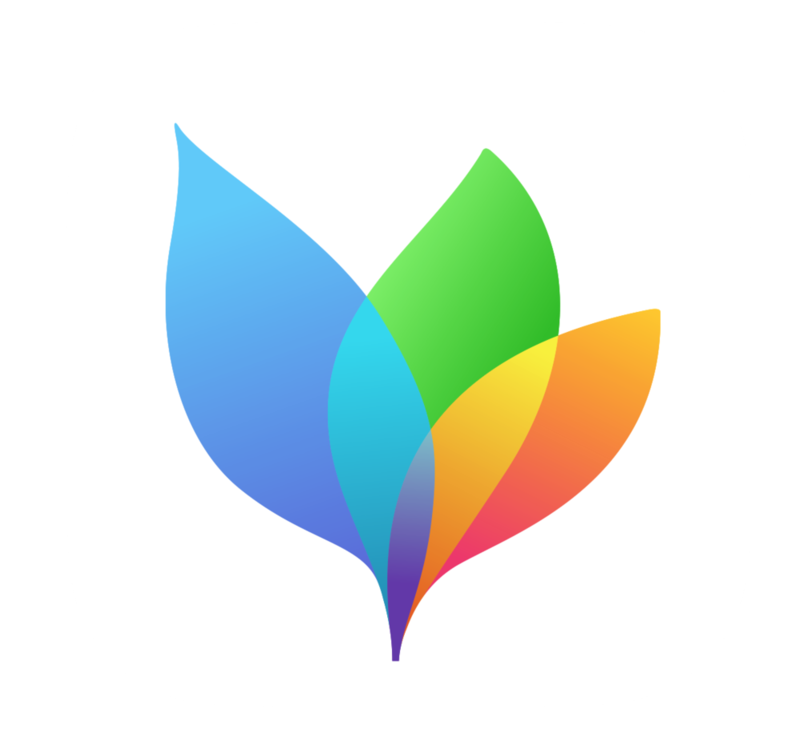 Both MindNode and iThoughts HD are high quality apps but also reflect different priorities. 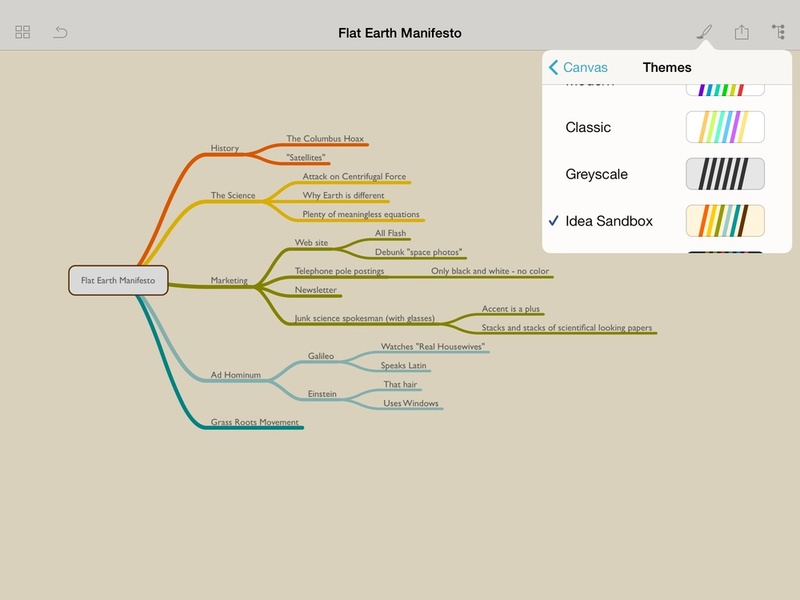 iThoughts HD still has the edge for export formats, customization, and features but for the way I mind map, I've come to the realization that MindNode works better. In the end, MindNode's clean UI, simpler design, and iCloud sync win out and MindNode now sits on my home screen. This is a free update. 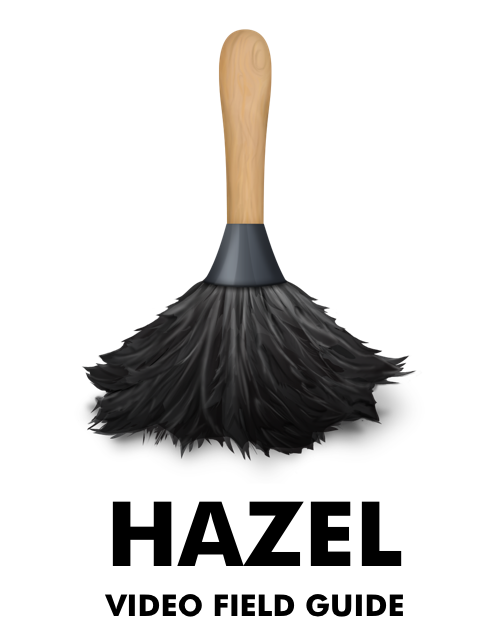 If you haven't already purchased the application, you can get it in the App Store for $9.99. Also, learn more at the developer's website. MindNode for iOS works both on the iPad and iPhone.